Podstel Bucharest i Buchuresti, Romania: Bestill nå! 1 - Podstel Bucharest: social, weekly events/workshops/family meals, garden, cafe/bar. 2 - Podstel Umbrella: more chilled, modern, comfortable, private rooms available. Welcome to the Podstel family! Podstel Bucharest is more than just a bed - we are a community hostel run by travellers, just a 5-minute walk from Unirii Square (centre of Bucharest) focused on giving each of our guests a unique experience by organising fun weekly events, insightful workshops & delicious family meals. We are owned and run by 5 best friends: Dan (UK), Sam (UK), Henry (UK), Jason (USA/Switzerland), and Ambrose (Canada/Portugal) who shared a collective dream to set up a home where travellers and locals could share their stories and learn something new from each other. Podstel Bucharest is the result of a big travel journey that started in 2012. On that journey we visited over 400 hostels in 50+ countries, collecting ideas while building our concept and trying to understand what travellers wanted from a hostel. We know what it’s like to be on the road. We all love to travel and have adventured to over 50 countries on 5 continents, learning from other hostels and interviewing 100s of backpackers in order to understand exactly what you need. Beyond a friendly social atmosphere, hot shower and good night’s sleep, we want to get to know you as a friend and give you personalised recommendations of things to see and do in Bucharest. We all love language, so to help make sure nothing is lost in translation, we can speak fluent English, Romanian, Spanish, Portuguese, Italian, French, German & Swiss German. We believe it's important to help you feel at home while you're on the road, so we've done our best to create a fun, homely and familiar atmosphere. 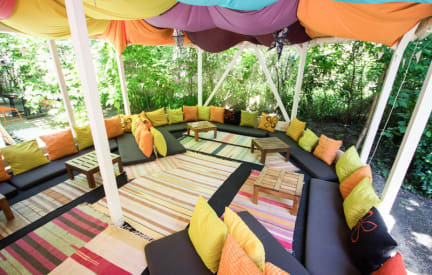 Our spacious garden is filled with lush trees & flowers, hammocks, a summer bar and an Arabic tent, giving the feeling of a chilled natural oasis in the heart of Bucharest. It’s a great place to unwind, enjoy a fresh smoothie and meet fellow travellers, locals and our two friendly house cats, Chai & Dharma. We also have a ‘secret garden’ with hanging flower baskets and comfy cushions, where you can kick back, relax or even enjoy a game of table tennis with fellow travellers or locals. We work hard to make Podstel a vibrant, creative, and social place to be. We are equipped with a stage, 90-inch projector and PA system, and can host events for up to 100 people in our garden. -Recurring weekly events including the famous Podstel family meals, unconventional movie night, 'skip the small talk' philosophical discussions and yoga. -Events: live music, art & cultural performances from locals. -Workshops e.g. meditation, writing, photography, drawing. -Presentations on themes such as travel, self-development and health. If you’re looking for chilled ambient music, good vibes and an opportunity to meet locals, expats and fellow travellers, our onsite teahouse/cafe is the place to be. It's also a great place to get work done with comfy seating, plug sockets everywhere and super fast Gigabit WiFi internet. -46 speciality teas from all over the world. -Toasted sandwiches & healthy snacks. In the Summer, we fresh fruit smoothies made with fruits and herbs grown in our garden, and homemade freshly-squeezed lemonades. In the Winter, we serve hot mulled wine. Podstel Bucharest is located in a quiet and safe neighbourhood just 500 metres South of Unirii Square. We are within a short walking distance to everything you will need for your stay (supermarkets, restaurants, parks, clubs, and many popular sights). We are also only 5 minutes walk closest to the bus stop of the 24-hour airport bus. -Unirii Square: 5-minute walk to shops, ATMs, currency exchange bureaus, supermarkets, buses and Bucharest’s main metro station, Piata Unirii (direct connection to Gara De Nord - main train station). -Nightclubs: 5 minute walk to two of Bucharest’s most popular clubs. -Old Town: 15 minute walk to all the bars, cafes, bistros, clubs, art galleries, antique shops & museums. -Other Key Places: 5 minute walk to Carol Park (Nation’s Heroes Memorial), 10 minute walk to Tineretului Park, 10-minute walk to daily free walking tour & 15-minute walk to Palace of Parliament. -A chance to meet our cats. -Fully equipped self-catering kitchen with a cooker, microwave, fridge, utensils, herbs & condiments. -Free use of musical instruments - ukuleles, guitars, microphones, keyboard and PA system. -Free use of the stage and opportunity to organise your own event or workshop. Lovely hostel, lovely staff. Amazing garden to chill those tired legs after a big walk and to meet interesting people. Thanks guys! I'm super impressed by how you run your hostel and care for your guests. Keep up the good work.